Lowell is one of the largest cities in Massachusetts, with a population of more than 100,000 residents. Its eight neighborhoods include Highlands, its most populous section, and Pawtucketville, home to a branch of the University of Massachusetts. The city played a pivotal role in the state’s economic growth during the Industrial Revolution. In recent decades, it has revised its zoning ordinance in an effort to stimulate economic revitalization and expand housing for Lowell residents. At Pulgini & Norton, our real estate and workers’ compensation attorneys provide knowledgeable representation tailored to the details of each client’s situation. Purchasing or selling property involves careful negotiation and drafting of documents, which culminates in the transfer of the real estate from one party to another. Whether you are a buyer, seller, or lender, you will need to protect your interests and understand your obligations to successfully complete the transaction. The offer to purchase, for instance, states not just the proposed price, but also whether the offer is contingent on any conditions, such as the inspection. The purchase and sale agreement may be heavily negotiated by the buyer and seller. It includes any other contingencies or conditions to closing, such as the buyer’s ability to finance the purchase. If you are a homeowner, you may come across a variety of real estate concerns. 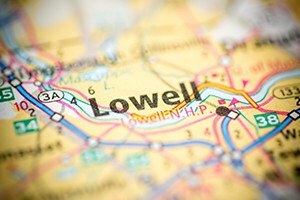 Changes in the Lowell Zoning Ordinance, for instance, may determine whether your property renovation or project is permissible. The ordinance establishes how an owner can use and develop his or her land. Some people begin projects, only to realize in the middle of the process that they need a permit or variance. A homeowner must apply for, and obtain, a special permit if required by the ordinance, or a variance if the project deviates from the ordinance. Lowell’s Board of Zoning Appeal and Planning Board have the authority to issue permits, but variances are only issued by the Board of Zoning Appeal. You may also have questions about insuring your home. Massachusetts property owners are not required to get homeowner’s insurance, but coverage may limit an owner’s liability in case of an accident on the property, and it can cover the costs of fire damage or theft. A lender may also require that a homeowner carry insurance. An insurer will make an offer based on its review of the property and the owner’s personal information, but it cannot consider factors such as race, marital status, and gender when offering coverage. Insurers do have the right to cancel a policy within 60 days of issuance if the homeowner fails to make his or her payments, or submitted false information in the application. Insurance policies generally run for one year, so a homeowner should renew, or obtain a different policy, annually to avoid any potential issues with a lender and to protect his or her investment. You may also want to reduce your tax liability. Property taxes are assessed annually, typically on January 1, to determine the property’s value and the owner’s tax liability. In some cases, a homeowner may reduce his or her tax liability by applying for an exemption or abatement. A homeowner must apply and qualify for an exemption or abatement each year. If you work in Lowell and are hurt or get sick during the course of your employment, you may be eligible for workers’ compensation. The Massachusetts Workers’ Compensation Act provides employees who have job-related injuries and illnesses with wage benefits, medical coverage, and other assistance. You can receive benefits if your condition takes you out of the workforce for a minimum of five calendar days. Wage benefits are based on the type of disability, and they are subject to yearly state minimums and maximums. Your employer’s insurer may deny your claim if it believes that your injury is not related to your job, or if it disputes its severity. We can help you appeal if an insurer denies your claim or seeks a modification of your benefits. The workers’ compensation and real estate lawyers at Pulgini & Norton can help Lowell residents assert their right to benefits if they are hurt on the job, or guide them through a complex property transaction. We have honed our negotiation skills and knowledge of the law over the course of four decades of practice. Call us today at 781-843-2200 or complete our online form for a consultation.